Award-winning journalist Jill Abramson, former executive editor of The New York Times, will discuss her controversial new book at a Headliners breakfast at 9 a.m. Feb. 14 in the National Press Club’s Fourth Estate Restaurant. 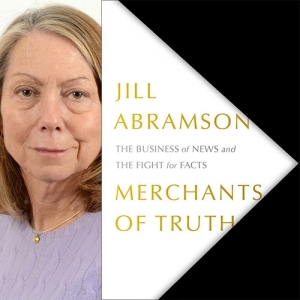 Abramson has defended the book,  “Merchants of Truth: The Business of News and the Fight for Facts," after a correspondent at "Vice News Tonight" accused her of plagiarizing several sentences in the book. Vice News is one of the news organizations that Abramson profiles in the book. Appearing on CNN on Sunday, Abramson told "Reliable Sources" host Brian Stelter, a former New York Times media critic, that she "made some errors" in the way she credited sources, but would make corrections. To attend the Headliners book event on Thursday, you must have a ticket. Tickets cost $10 for Club members and $15 for non-members. When purchasing your tickets online, you will also have the option of buying a book upon check-out, which will be available for pick up and signing at the event. Copies of the book will also be available for purchase at the door. The event opens with a light breakfast of assorted pastries, coffee and tea at 8:30 a.m. The program will begin promptly at 9 a.m. The book, using the examples of two legacy heavyweights, The New York Times and The Washington Post, and two digital upstarts, BuzzFeed and Vice, dissects the disruption of the news media, its attempts to adjust, and its uncertain future amid President Trump’s war on the press. Proceeds from the book sales will benefit the National Press Club Journalism Institute, the non-profit affiliate of the Club, so the Institute asks that you leave all outside books at home.